Tendu leaf, a Minor Forest Produce (MFP) used to roll beedi, is the financial lifeline of the forest tribes of central India. The tribals collect the leaf as part of their right defined under Scheduled Tribes and Other Traditional Forest Dwellers (Recognition of Forest Rights) Act, 2006 (FRA). MFP, as defined by the FRA is “all non-timber forest produce of plant origin and includes bamboo, brushwood, stumps, canes, Tusser, cocoon, honey, waxes, Lac, tendu/kendu leaves, medicinal plants and herbs, roots, tuber and the like.” Tribals have the right to procure and sell these products. The tendu leaf, due to its use in the production of beedi, fetches a good price. 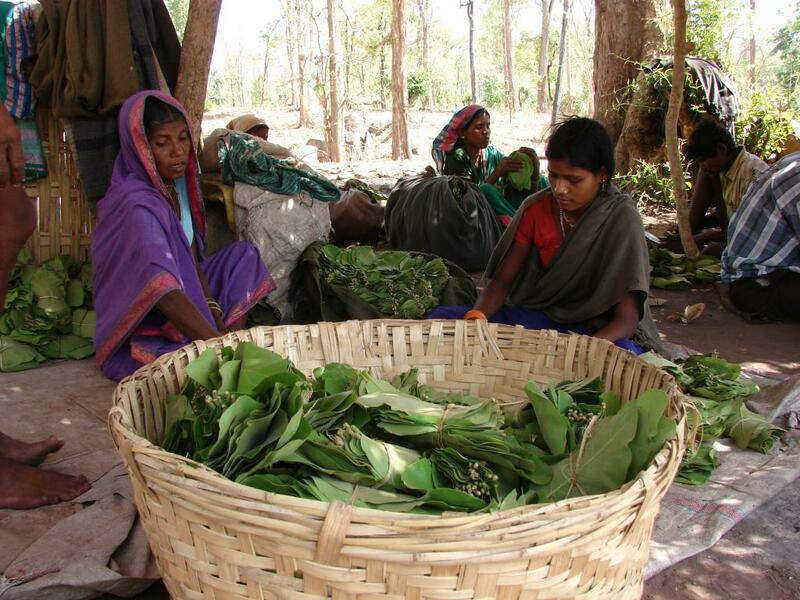 According to the Madhya Pradesh State Minor Forest Produce Federation, a body that collects tendu leaves in the state, the collection rate of tendu leaves was Rs. 1,250 per Standard Bag or 50,000 leaves in 2016. However, from July 1, as India entered a new system of taxation, the Goods and Services Tax (GST), a centralised tax was imposed on tendu leaf for the first time. The GST on the leaf is set at 18 per cent. The 18 per cent GST is made up of 9 per cent central GST (CGST) and 9 per cent state GST (SGST). Central tax on the leaf was earlier zero. Earlier, only sales tax (VAT) was levied on MFP like tendu leaves. But VAT wasn’t applied everywhere and it varied from state to state. In Odisha, the state levied a 5 per cent VAT and 2 per cent forest tax on tendu. This amounts to 7 per cent state tax in toto. In Rajasthan this figure stood at 5.5 per cent VAT. In both the instances, the new SGST is more than the earlier levied taxes. In fact, the total increase in the tax on tendu patta has sky rocketed, increasing by around 200 per cent in places like Rajasthan, which is a cause of concern for many. “This hike from 5.5 per cent to 18 per cent is a lot. Now, as the tax is high, the traders who get the tender from state corporations to collect tendu leaves will pay even less to the tribals collecting the leaves,” says Kamendra Singh Rathore of Samrthak Samiti, Rajasthan, a society of forest produce collectors. Rathore says that this will also lead to a reduction in the funds given to the Gram Sabhas who are entitled to the profit made in the process of selling the leaves by the state corporation. There are others who have questioned the rationale behind the increase. "Kendu patta has seen an increase in taxes as compared to other similar products, like cigarette paper," says Manas Rajan Mishra who works with Odisha-based forest rights groups, Vasundhara and the Kendu Leaf Support Group, and adds, "The GST is the same on both—18 per cent. But the SGST on cigarette paper in Odisha was earlier around 12 per cent, now it has come down to 9 per cent." He questions the reason to tax a commodity collected by tribals more than an industrially produced commodity. While Rathore is of the opinion that the actual collectors of leaves will suffer under the new tax regime, Dilip Gode, a forest rights activist from Maharashtra says that the tax is contrary to what the FRA says. “The Forest Rights Act says that it’ll be free from all the taxes of the government. The Gram Sabha is the principle organisation to sell the produce. It can do so through a body that it authorises to do so. But under the Income Tax Act, the Gram Sabha is exempted,” he argues. Gode adds that there is no clarity on the issue. The lack of clarity is also present in the Tribal Co-operative Mareting Development Federation of India (TRIFED), a government body under Ministry of Tribal Affairs to market tribal products. Talking to Down to Earth, a senior official from TRIFED said that they are still collecting information on the issue of GST and currently are not sure how the new tax regime will function. “It’s just been two weeks since GST was implemented. It’ll take time to understand how it’ll work with the collection of MFP,” the officials said. As of now, the collection season of tendu (April to May) is over. The government officials have time to think the new tax structure through. But confusion apart, the hike in taxation will surely take a toll on the tribals who depend on the leaves for subsistence. Astonishingly for last 80 years, many Tribal Communities (Hindu & Real) are living on only Tendu Leaves. Curiously, Muslims (Outcastes) got many achievements (forced & deceitful) compared to the Tribes. Congress or BJP sees the Tribes as a fine / compensation in Public Order Finance. Supreme Court should bring a NGO clarity.